Head over to SkateHouseMedia.com to check out the video from the finals of the Hawaii Winter Outlaw Series event 4... The Maui Challenge. 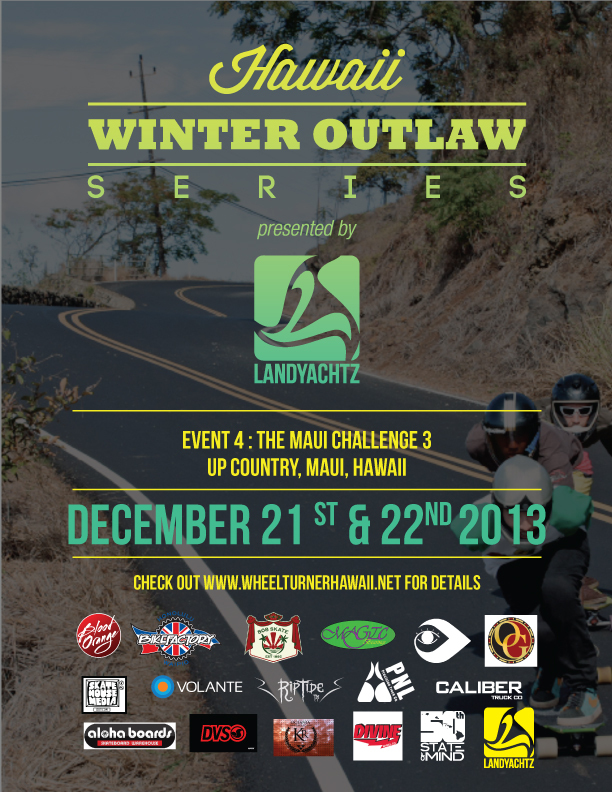 Here's a video from this past weekends Hawaii Winter Outlaw Series event, The Maui Challenge. Thanks Tyler for capturing the goods! The crews from all the Hawaiian islands plus some international visitors battled it out today for the win at THE MAUI CHALLENGE. 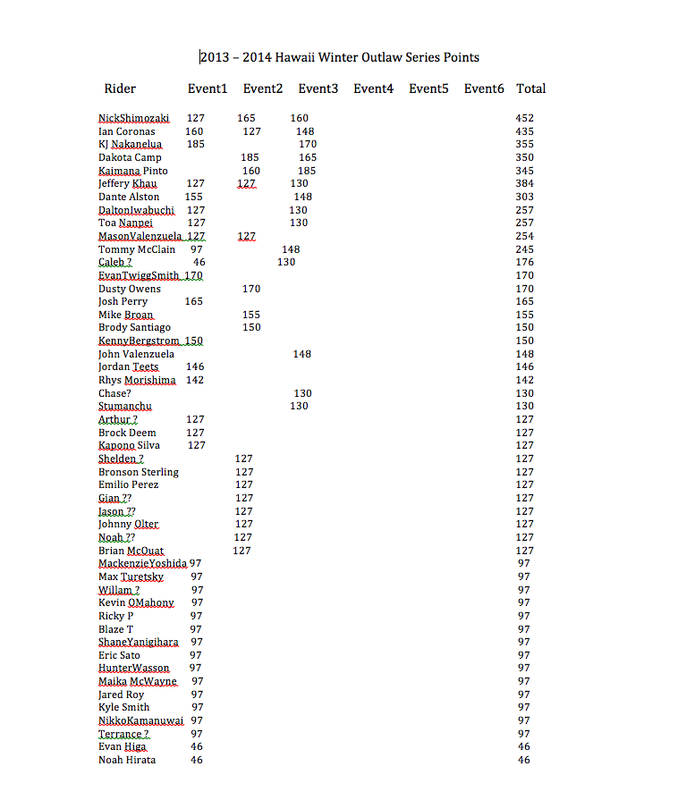 After a long day of jamming and racing on world class pavement we have out results! 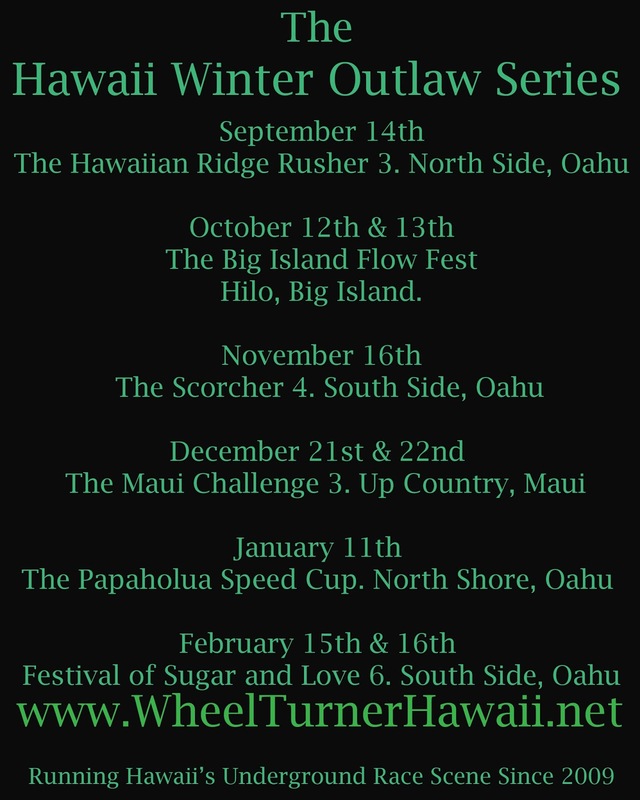 HawaiiWinterOutlawSeries Overall Series Points. *Halfway Update. 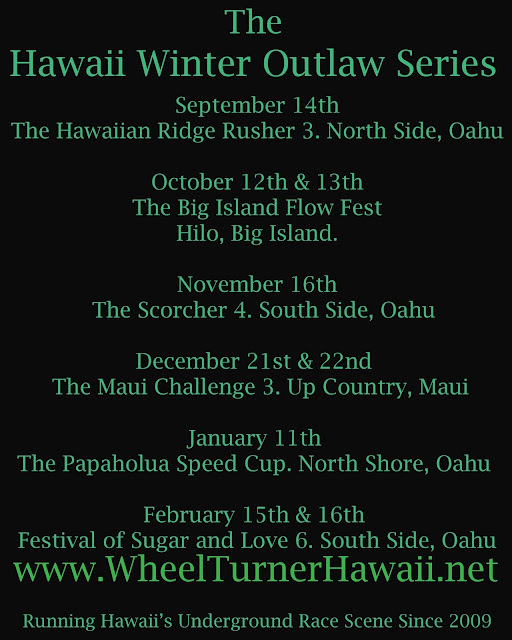 Ladies and Gentlemen, the HALF WAY point to the Hawaii Winter Outlaw Series is HERE. I got it all added up and it's going to be an epic battle for the win! to top it off the 1st Place skater for the year will go home with a BRAND NEW set Pretty Noise Lab Precision Trucks! Keep on shredding guys, its gonna be a tight battle for the win! Though the results are wrong... the video is rad! The Scorcher 4 from Evan Higa on Vimeo. The good guys over at SkateHouseMedia just posted a little recap of the finals of our last Hawaii Winter Outlaw Series event... The Scorcher. Get over to their site now and check it out! 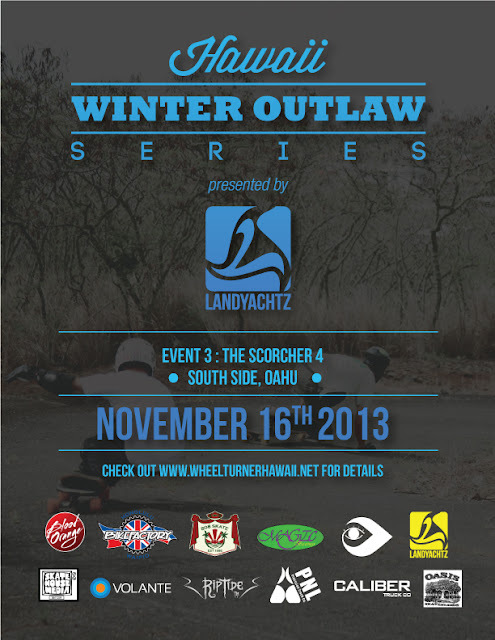 HawaiiWinterOutlawSeries Event 3- The Scorcher 4 Writeup, Photos and Video! It's a humid, voggy Saturday morning on the island of Oahu, Hawaii and the butterflies sure are flying around in some tummies this morning. It's that time of the Hawaii Winter Outlaw Series for riders to battle it out on The Scorcher for the 4th year! If you skate hills in Hawaii and follow the race scene at all you know that this course is one of the gnarliest to be raced in Hawaii. It consists of 3 back to back hairpins ( 4 in the past ) linked with STEEP straights. If that doesn't sound too bad, theres cracks, deep potholes and live grass growing in the road to add some fun. If you don't let that get to your head, the road is pretty much made for shredding! Riders hailing from Oahu, Maui and Canada gathered first thing in the morning at a beautiful Hawaiian garden near the race course. We got everyone who had the sacks to enter signed up, made the 1vs1 race bracket, then headed to the hill to get Scorched! 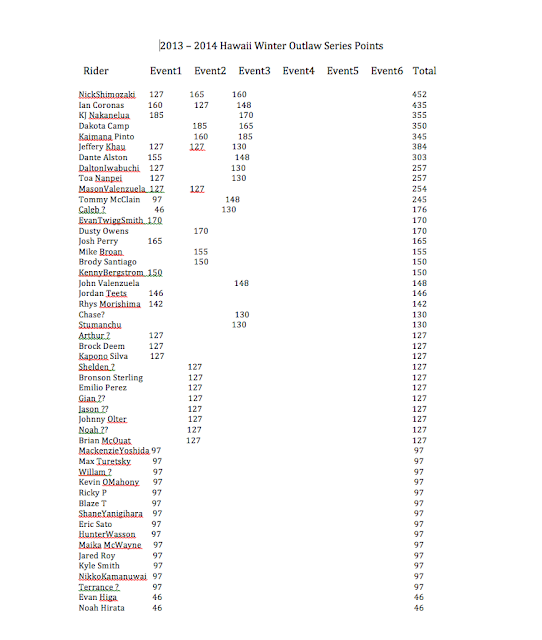 This year we had our LEAST amount of entry's, but tons of riders around. Some took a run and decided they were over it, some got scorched in the couple of practice runs, and others just wanted nothing to do with the hill. BUT, the 16 riders we had were ready to go for the gold. Once riders felt comfortable- ish on the hill, we got corner marshals set, cleared the course and the first round of 8, 1 vs 1 heats were underway. At The Scorcher, riders are allowed to choose their own start methods... and we saw them all. One push, unlimited, throw down, even no push. Just do whatever you can to be leading into corner 2, " The Landyachtz righty", which is the fastest corner of the course. Round 1 rolled along smoothly. The 8 heats went up the hill and came down when they were ready. Skaters must have just wanted to get it out of the way because the round was finished within minutes! Every one of these heats looked like they could have been a final round in the past events. Riders were close through out the whole course and there were barley any crashes! After round 1 was complete, riders got refueled and headed back up the hill for the quarter finals. The Canadians were out, but a good about of both Oahu and Maui rippers were still in. The quarters were Kaimana P. vs Dante A., John V. vs Dakota C., Tommy "Cookie" M. vs Nick S. and KJ N. vs Ian C. ...Some of Hawaii's best in my opinion. First up, Kaimana and Dante. Kaimana got out in front, kept his line solid with last years winner Dante sniffing his tail... but he didn't let him by. Kaimana Takes the win. Next the all Maui heat, John V vs. event 2 champ, Dakota Camp. John took the aggressive start and got in front through the first corner, Dakota following closely behind. As they approach the Landyachtz righty they are flying, both riders drift fairly late. John starts to slide out and ends up taking a crash. Dakota is right there to make the swoop and keeps the lead into the last corner. These guys both wanted it bad. Cookie got into the lead at the start, but not by much. As the riders come into The Landyachtz Righty, Nick links a perfect line for a clean pass in the corner. Cookie isn't far behind as they go into the last left. Mid corner he decides to try to repass, and ends up bumping Nick causing them to both crash. Cookies board headed down the hill causing him to run across the finish. Nick jumped back on board and was the first person to cross the line on board... so he takes the win! Last in the quarters was KJ and Ian. KJ had a real quick throw down start getting him into the lead in the first corner. As they approached The Landyachtz Righty KJ drifted a second earlier then Ian causing him to catch up quick and drift into the back of his board making both riders fall. But KJ was quick to get back on board and got down the hill in front. Now we are down to the Semi Finals, the final 4 riders. No matter how they do they get to skate 2 more runs on the hill... either in the Finals or the Consi's. Up first is Nick and KJ. Off the start KJ's speedy throw down gets him in front once again into the first left with Nick closely behind. Coming down the straight into the Landy righty they both held their tucks straight into their drifts, Toeside for both riders. Nick links up from his drift early and pins for the inside line as soon as KJ is standing up. The magical nebulas powers must have came into play ( or he herd Nick coming) and KJ decided to throw a standup drift to tighten his line. This totally blocked out Nick's attempt to pass and made em slide out... KJ riding away clean for the win. Now it's Dakota vs. Kaimana. The start was a push vs throw down... Kaimana's throw down gets in front. Both riders pull clean drifts but Dakota links a little earlier getting him speed to pass in the Landy righty. BUT, Kaimana dosent let him slip away. In the final corner Kaimana pins the inside line while Dakota minority slides out.... but it was just enough for the pass. Kaimana moves onto the final. Dakota Camp and Nick Shimozaki. The riders start with a one push start, Dakota leading into the first left. Full tuck down the steep straight. Both regular footers pull clean drifts in the fast right, with no passes made. As they come into the last left, Nick is close... but not close enough for a pass. Dakota takes home 3rd place and Nick 4th. Highschool buddies, KJ Nakanelua and Kaimana Pinto. These two learned how to skate down hills together! I feel like every once in a while there are duo's in DH that REALLY vibe off each other... and this is one of them. Ready, set... go! Both riders run for the throw down... but KJ proved that his is unbeatable and he stomps onto his board for a clean line in front of Kaimana in the first left. As they speed down the steep straight, KJ holds his tuck but Kaimana's right there carving to not catch him too quickly. Approaching the drift all we can hear is KJ SCREAMING in stoke and a bit of fear. They both pull clean drifts into the Landy righty. KJ backside, Kaimana frontside. On the exit KJ seemed to loose a tiny bit of grip allowing Kaimana to pull up right where he wanted to be. The crowd was running after the racers down the hill to watch the last corner... but its a good thing they did. Kaimana jumps onto the smooth patch of pavement on the inside of the last left while KJ gets stuck on the normal rough section and he SLINGSHOTS by. Kaimana Pinto keeps the lead to the finish and is the new SCORCHER CHAMP. The Scorcher 4 is complete! The crew of riders return to the garden following the race for a awards ceremony. The top 4 shredders were awarded with Ca$h and a ton of schwag. BUT, we still had a ton of prizes... so we passed out goods to every racer who had the guts to enter. Thats a great way to stoke out the crew after a good day of skating! We want to give a HUGE MAHALO to the supporters who helped us make this event possible! Event 3- The Scorcher 4. 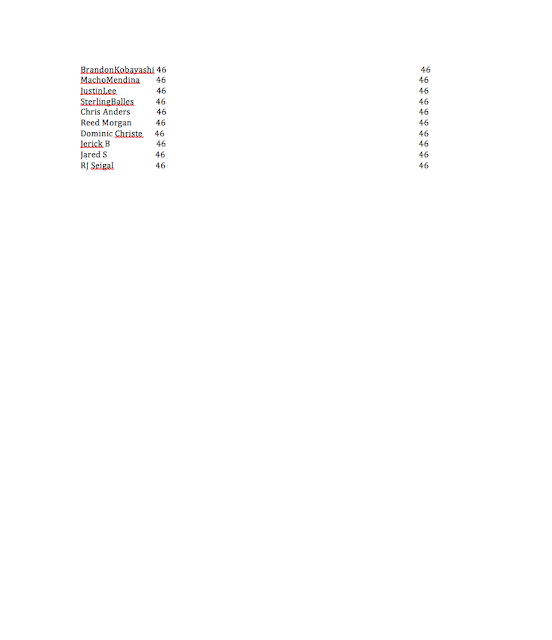 Full halfway points ranking's will be up soon so be sure to check back! The Scorcher: 2013 from Na He'eHolua Project on Vimeo.